Great for natural-looking portraits, close-ups, and detail shots, this medium telephoto L-series prime lens from Canon lets you shoot at a relaxed distance from your subject. This lens excels indoors and in low light, thanks to its large maximum aperture. Nine circular aperture blades deliver smooth defocused backgrounds so your subject is sure to stand out. This is Canon's first 85mm L-series lens to have built-in Image Stabilization to minimize image blur and camera shake when shooting in low light without a tripod. Overview: The Canon EF85mm f/1.4L IS USM lens is an L-series, fixed length, medium-telephoto lens for Canon EOS cameras. The lens has a high-precision, large-diameter aspheric lens element for excellent imaging performance, even at maximum aperture. The round aperture gives you a narrow depth of field and the desired soft background blur. The lens includes the LP1219 Lens Case and the ET-83E Lens Hood. Ultrasonic Motor (USM): The EF 85mm f/1.4L IS USM lens is equipped with an Ultrasonic Motor for silent, high-speed auto focusing. The inner focusing system works with a high-speed CPU and optimized AF algorithms to provide its quick, accurate focusing performance. Image Stabilizer (IS): Camera shake can cause blurring when shooting in low light and at long focal lengths. Canon's advanced Image Stabilizer uses digital technology to detect camera shake and signal precise lens shifts that compensate for the movement. The EF 85mm lens provides significant shake reduction equivalent to up to 4 shutter speed steps. You can turn the Image Stabilizer on or off as desired by using the 2-way switch on the lens barrel. With the switch set to On, image stabilization begins when you press the shutter button halfway. Once the image in the viewfinder is stable, you can take the picture by pressing the shutter button the rest of the way. Lens Construction: The EF 85mm f/1.4L IS USM has 14 lens elements in 10 groups, including a molded glass (GMo) aspherical lens to provide sharp images from edge-to-edge. The Image Stabilizer lens features Canon's Anti-reflective Coating (ASC) to reduce flare and ghosting when shooting backlit subjects. The front element of the lens features a fluorine coating that prevents fingerprints on the lens and stops dirt from sticking. This allows you to easily wipe away dirt and fingerprints that may appear on the lens surface. Lens Hood: The lens kit includes the ET-83E lens hood to keep unwanted light out of the lens, and protect the front of the lens. The hood can be reverse-mounted on the lens for storage. When installed, the hood adds approximately 1-1/4" to the overall length of the lens. Optional Filters: The EF85mm lens has a 77mm mounting thread on the front of lens for attaching screw-on type filters. 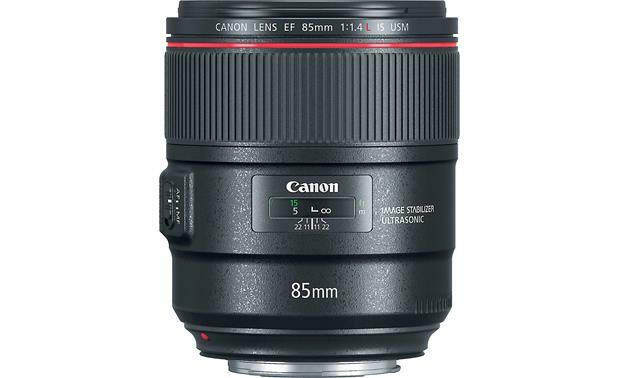 Searches related to the Canon EF 85mm f/1.4L IS USM Medium telephoto prime lens for Canon EOS DSLR cameras.